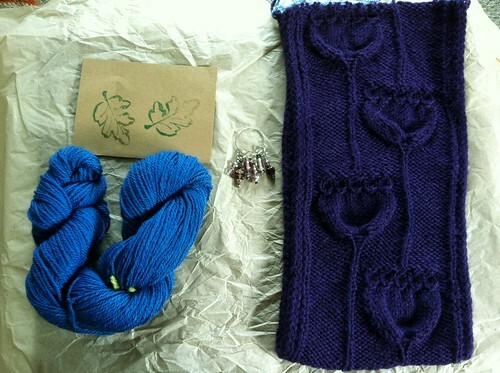 She also sent me some yarn and stitch markers. The rest of the project is to knit the other portion of the cowl for myself and graft the two pieces together. I need to find the yarn and do it, preferably before next winter begins! I also need to figure out where I hid the part of the cowl my partner knit. Verdict: Finish it, if I can find the yarn and finished half. Each year, my knitting group heads out to Port Townsend for a low-key weekend of knitting and wandering around the town. A walk on the beach is usually a part of the weekend as well. On the way there we stop at The Artful Ewe in Port Gamble, then head into Port Townsend where we have lunch at the Public House. This is one of my favorite parts because they have vegetarian poutine! Then we checked into our house at Fort Warden and spent the evening knitting. The next day was my birthday, and I was lucky enough to get to spend it with my lovey knitting friends. We went out for breakfast and I had a really yummy rhubarb waffle! That night we went out to Sweet Laurette’s, a nice little French restaurant. I had a beautiful dinner of grilled veggies and lentils, and finished it off with a chocolate cake. Plus everyone sang to me in the restaurant, which is usually embarrassing but was OK because there were only a few other people and one of them was having a birthday too. This year I also finished a pair of socks on my birthday! The pattern is Fork In the Road Socks by Lara Neel. I tried it out because it has a different type of “afterthought” heel (not actually an afterthought since you knit it between the leg and the foot, but whatever). I’m not crazy about the fit, but it does seem like it might be a bit better for my feet than short row heels. We shall see. After some more knitting, we headed out Sunday for a stop at Churchmouse on Bainbridge Island before returning home. It was a really nice weekend! Steph and I are heading down to Portland for a girly knitting weekend. We’re already seeing quite a bit of rain, so it seems the weather warnings about 12″ of rain and flooding weren’t kidding! While she drives, the New Year socks are nearing completion! Back in December I got an email from Hannah at Yarnbox asking if they could use one of my patterns for the very first Yarnbox Socks. They had a dyer back out and there wasn’t time for the selected designer to design a new pair for the new yarn, so they decided to use Intercalate. 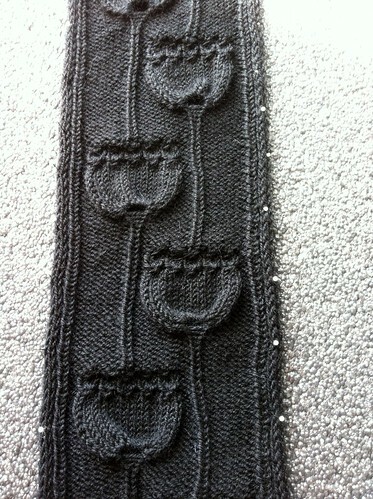 Hannah started knitting up a sample in their chosen yarn, Koigu KPM. Looking at the beautiful color selections, I can’t wait to see people get their boxes and start knitting up their socks! Following the KAL and seeing new projects pop up will be a lot of fun! Later this year, I’ll be designing a custom pattern for them for a different yarn. The poor ill-fated Ice Queen was started on November 29, 2008. Unlike Hush Hush, I really have no idea what possessed me to start this project. The yarn is Kidsilk Haze, and I hate silk. The color is really not me. The pattern, though lovely, is not my style. I can only imagine I meant it to be a gift. Then, a few inches in, disaster struck when I made a mistake. I had heard that Kidsilk Haze was nearly impossible to frog, and I couldn’t be happy with a mistake in the lace pattern. Plus, there were the beads! At that point the project was abandoned, probably only days after it had been started. There really wasn’t a question about what to do with this one. It turns out Kidsilk Haze really isn’t that hard to frog after all. On Friday I met up with my friend Steph for a yarny field trip. She has a brand new blog, by the way. She also took all of these pictures, since I was my usual self and didn’t take any. We used the end of our holiday break to head out to Tolt. Before we went she asked me what I wanted to get, and I told her that I actually just wanted to go look. You would think, since I work at a yarn store, that I would be tired of spending time at yarn stores, but that just isn’t true. One of my favorite things about Tolt is their space, and this light in particular. I found this knitted apple, and just had to strike a Twilight pose. And I found some exciting yarn, too! I did end up getting the Intrepid Otter in my right hand, but not the Insouciant in my left. No matter how hard I wished, I couldn’t turn the brown Jacob into grey. But it was really lovely stuff, I’m almost regretting it now! 2014 was a pretty productive year for knitting! The Rhinebeck Socks are done! With this last project of the year, the WIP count is down to 28. Now it’s about time to ring in the new year with some sparkling cider.